Is also the 50th anniversary of Kubrick's iconic film 2001: A Space Odyssey that redefined the look of science fiction at the movies. We played this once before to great acclaim, in fact Ann says the recording - which you can find on Soundcloud - is 'one of the best things I've ever done'. Which for an exacting and talented musician like her is praise indeed. But that was (whispers) 13 years ago, in the Bell Love Lounge. It's now 2018 and we're very very excited to be doing this again. 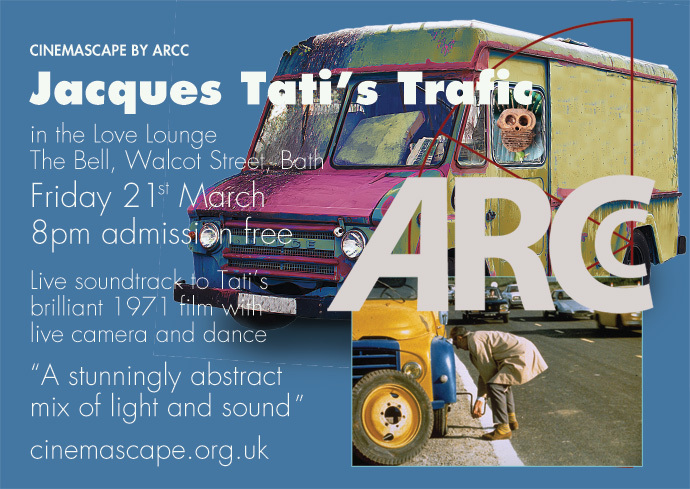 So.... once more chill to the voice of HAL, listen to the hypnotic and captivating improvisation of ARCC, settle back and watch this wonderful film as you've never experienced it before. 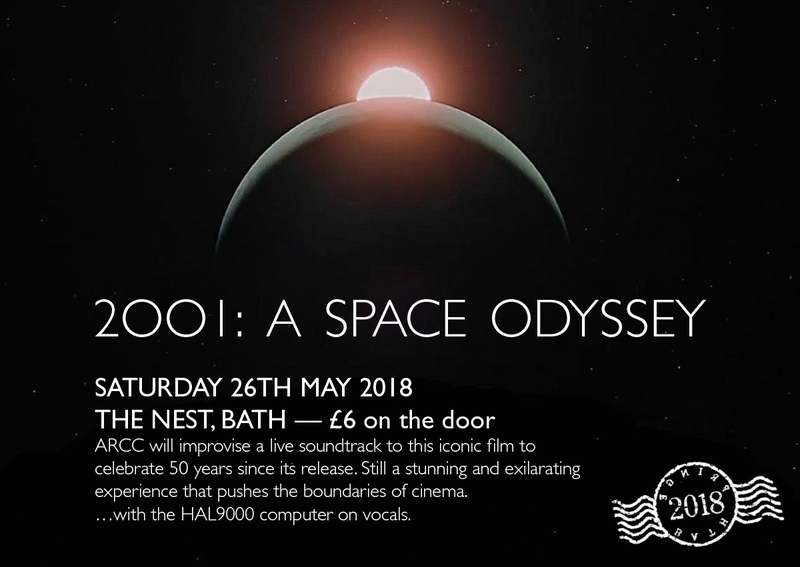 Bath band ARCC will reprise their completely improvised soundtrack to Kubrick’s 2001: A Space Odyssey to celebrate the 50th anniversary of this iconic film. ARCC are a Bath based four piece who play swamp blues (like the desert blues but there ain't no deserts in Bath) – tinges of West African blues, celtic soul and dub. By improvising a soundtrack to the film that weaves in and out of the narrative they create an immersive, intense experience. With a live VJ mixing film, live camera and effects onto multiple projection screens this is 2001 but as you've never seen it before. 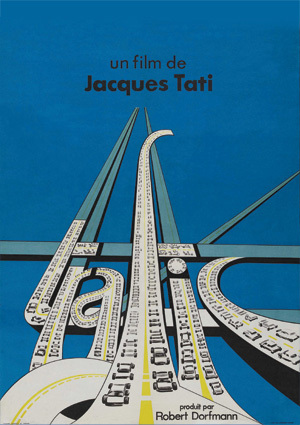 ...and another one, bit more upbeat, Jacque Tati’s Trafic, a gently hilarious take on traffic and the modern world every bit as relevant today as it was when made in 1971. and with some tasty vintage vehicles too - as well a good sprinkling of authentic early 70s hippies. The legendary French comedian Monsieur Hulot, played by Tati, returns for his last film as a bumbling car designer making his chaotic way to an auto show in Amsterdam. With a humour that is based on acute observation of the comedy of the absurdities that surround us every day. ...and a special birthday too. ARCC are a four piece band playing improvised music to film manilpulated by VJ Arnie and accompanied with dance, movement and live camera by Bethan White. Swamp Blues: Occupying a space that encompasses ambient jazz, progressive rock, traditional folk and dub, creating our unique, self-styled swamp blues, ARCC re-score the soundtracks of both short and feature length films. 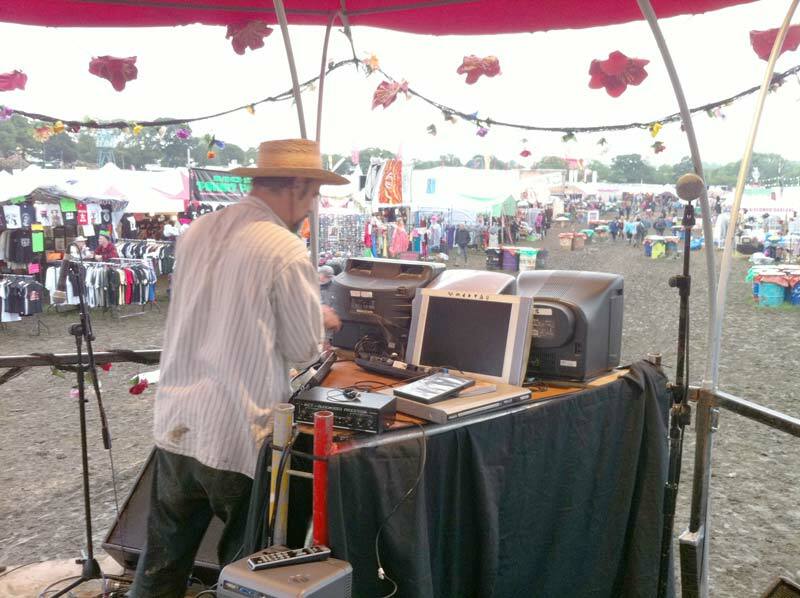 Inspired by a wide range of musical and cinematic genres, from the desert blues of Mali to west country punk through to celtic tunes, dub and rock, romance to sci-fi, darkness through to light. The name we give to our evenings that usually include performance by ARCC, collaboration between VJ and DJ - Yellow Submarine and Barbarella, two very popular recent collaborations, give you a flavour of that. Throw in a sprinkling of poetry, acoustic music, puppetry. Video decor, with the use of multiple projectors and freely mixed visuals give any space a totally different and magical feel. Popcorn and Ice cream are indispensable acompaniments to this cinematic feast. ARCC are saving up for a Wurlitzer organ that comes through the floor during the interval. Please note our email address has changed and is not a link anymore, the spam harvesters sure are efficient these days. We'll be playing to a selection of our favourites, Buster Keaton will be there, L'Homme Sans Tête, We Have Decided Not to Die, of course Giselle Kerosene and others. We're making a film. To try and get some class concerts next year, ARCC is stalking its audience. So there might be more technology knocking about as we set up for a video shoot with new VJ and Director Mike Sides. 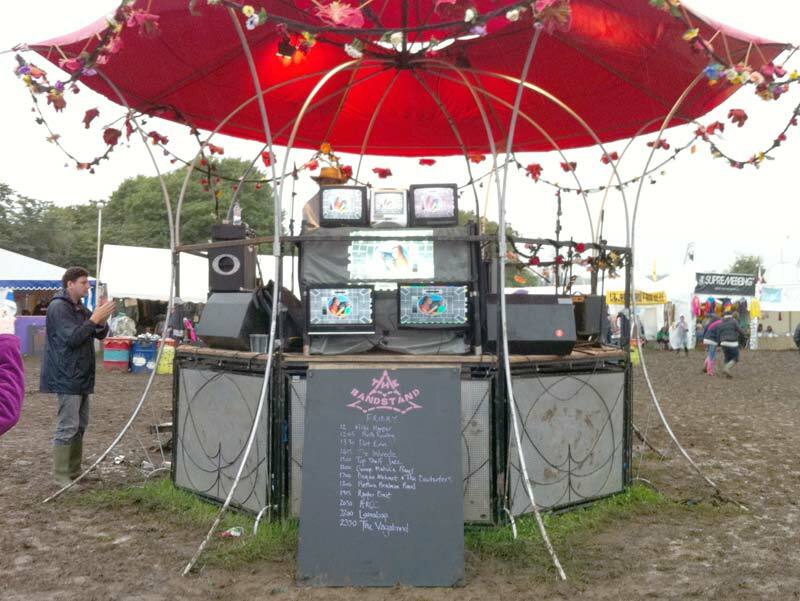 Well we played Glastonbury, the first outing for the Big TV, a portable Cinemascape viewer that in its first incarnation was a big success. Despite the awful weather, much legendary Glastonbury mud and continuous rain we had by the end of the set gathered quite an audience at the Bath Bandstand stage. The ARCCster's will play to a selection of modern short films. Ritzy Cinema in the Love Lounge at The Bell, Walcot Street, Bath. Doors open 8pm, main feature at 9pm. 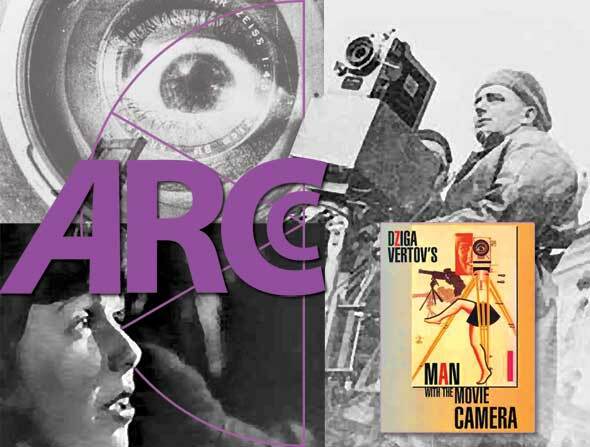 The main feature, Man with Movie Camera, made by Russian director, Dziga Vertov in 1929, is a film without narrative, a warm and personal insight into Russian life of the late 1920s. With ground-breaking composition, editing techniques and effects this film is famous for the range of cinematic techniques Vertov invented, deployed and developed, astounding in their day and a huge influence on film makers. The overall speed is fast moving and enthralling, even with no actors the sequences and close-ups capture emotional qualities which could not be fully portrayed through the use of words. In The Space, transformed by multiple screens and video decor, ARCC will improvise a score borrowing from British and Eastern European folk music entwined with powerful live drum and bass groove. Come watch, listen, dance and enjoy this unique experiential evening. 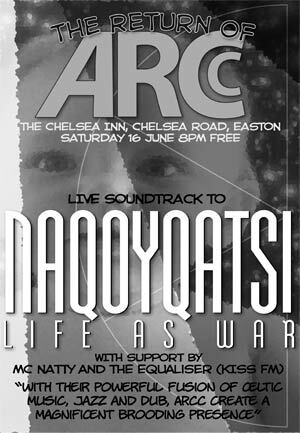 Saturday 16th June 9pm - The Chelsea, Chelsea Road Easton Bristol. Free Admission. Naqoyaqatsi, the last of the 'qatsi' trilogy by Godfrey Reggio, released in 2002. We are hoping to do a series of 5 or 6 gigs in the autumn - get in touch if you knwo somewhere we can play. Most of us are involved in a monthly Eastern European folky session on the 2nd Wednesday of each month formerly at The Printer's Devil (near the Evening Post building). We are temporarily without a home, a situation that is close to being sorted. Email annballinger@hotmail.com if you want to be kept up to date about this session. There is a resource for the tunes and words here . Buy 'Happy Jack' at Ashton Court Festival on CD. Usually when you hear the words "world premiere" you can safely assume that although it may be the first performance for the public of that show there will have been extensive rehearsals and previews. When ARCC says "world premiere" - it does exactly what it says on the box. Ashton's Courts performance of Happy Jack, apocryphal tale of our times, was not only the first time the show had been performed in any way, it was also the first time that bunch of musicians had all played together. 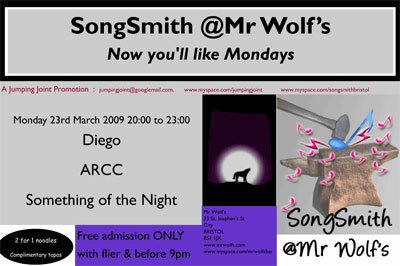 With a story written and performed by word floozy Rosemary Dun, visuals performed by VJ Fieldov, ARCC were augmented for the occasion by Dave 'Needles' Pierce on saxophones and Andy Drumm N. Bass on keyboards. We have a CD for sale, personalised for you, of that premiere performance at Ashton Court in the Blackout tent on 23rd July 2006. There will never be another exact repeat of that performance. The recording you will receive will in some way be totally unique. Maybe a mix, artwork, message, all three? Try it and see. Take a listen to some of our free music, all unique improvised performances themselves. 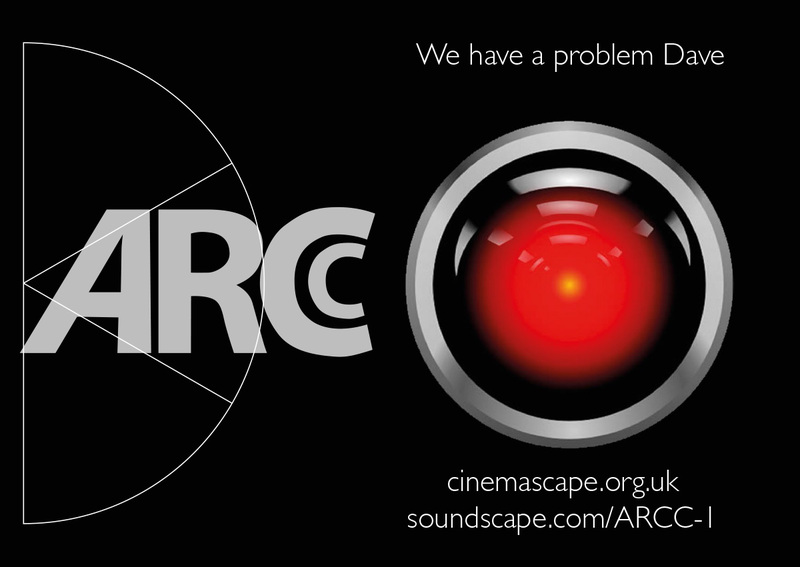 ARCC are currently looking for a keyboard player, sound manipulator, mixer or engineer. So if you live in the Bath or Bristol area of Southwest England and have an interest in film soundtrack and live music, do get in touch. We also seek collaboration with anyone having an interest in sound and image, Vjs, poets, Djs, filmmakers, installation artists. In fact if you can think of any way in which we can collaborate, please get in touch.